Winner of the 2010 Sigourney Award! How has Hanna Segal influenced psychoanalysis today? 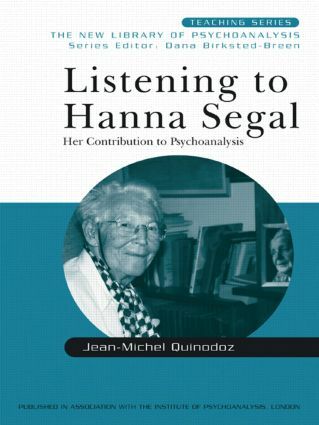 Jean-Michel Quinodoz provides the reader with a comprehensive overview of Segal's life, her clinical and theoretical work, and her contribution to psychoanalysis over the past sixty years by combining actual biographical and conceptual interviews with Hanna Segal herself or with colleagues who have listened to Segal in various contexts. the introduction of the "symbolic equation"
introducing the work of Melanie Klein. Quinodoz concludes by examining Segal's most recent contribution to psychoanalysis - exploring nuclear terror, psychotic anxieties, and group phenomena. Throughout the interviews Segal speaks of her close relationships with prominent colleagues such as Klein, Rosenfeld, and Bion, making this book both a valuable contribution to the history of psychoanalysis and an indication of the evolution of psychoanalytic ideas over the past six decades. This clear summary of Hanna Segal's life and her contribution to psychoanalysis will be an essential guide to anyone studying Segal and her contemporaries.